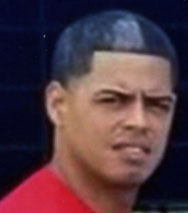 Luis Alfredo Ramos Diaz, 27, of Cranston, passed suddenly on July 15, 2018 while on vacation in Puerto Rico. He was born in Puerto Rico a son of Norma Diaz Oyola and the late Wilfredo Ramos Gonzalez Luis worked in construction hanging sheetrock for New England LCC for more than 4 1/2 years. Besides his mother Norma, he leaves a girlfriend Ginaida Cordoda, and 6 brothers, Joshoa Diaz and Yelitza Diaz of Puerto Rico, Jerry Diaz of Providence, and Joseph, Kiovany and Jose Diaz all of Cranston. His life will be celebrated with calling hours Monday, July 30, from 5-8 pm in the Stapleton Family Funeral Home 684 Park Avenue, Cranston. Mass of Christian Burial in St Matthew Church, Elmwood Avenue, Cranston Tuesday at 10:00am. Burial will be in North Burial Ground, Providence.